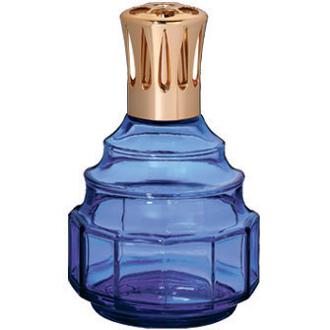 The Lampe Berger Ondine Sapphire Blue lamp is derived from the "CR Crystal" lamps produced by Lampe Berger around 1947. In the alchemy of Paracelsus the ondines are water elementals. The lamps impart an aqueous luster to transmitted light. The lamps come in a small gift box with a burner, funnel and instructions.